ENCINITAS — The Leichtag Foundation and a San Diego architecture school have teamed up to design what will be the centerpiece of the Foundation’s flagship event, the Sukkot Harvest Festival Oct. 4. On Wednesday night, an intimate audience got a sneak preview of the winning design for the sukkah, the temporary hut-like dwelling that defines the festival. 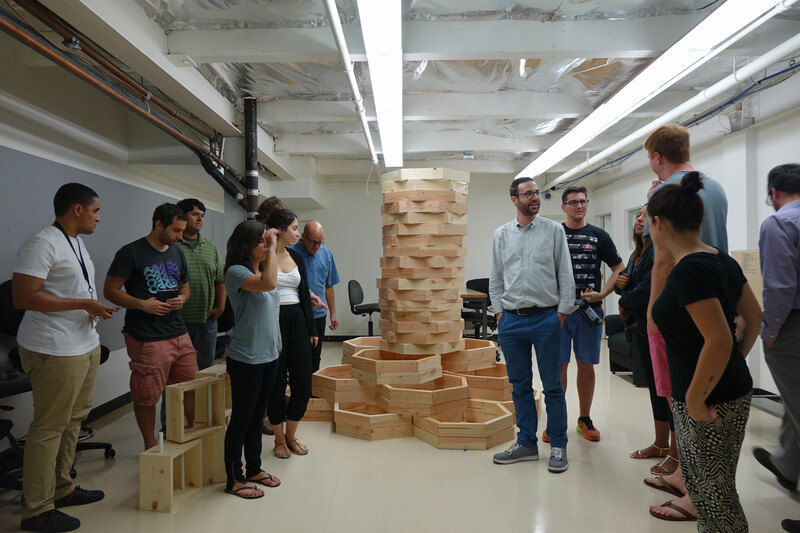 The Foundation partnered with the NewSchool of Architecture to host a competition to design the sukkah, an ephemeral hut-like structure, that will be used as a gathering place during the festival, which commemorates the Jewish holiday of Sukkot. Sukkot, also called the Festival of Booths, commemorates both the harvest and the 40-year period that the people of Israel wandered the wilderness, living in temporary structures, known as sukkot (the plural for sukkah). The people of Israel were to construct sukkot and live in them during the seven-day festival. Every seventh year, the festival takes on deeper meaning as at the end of the festival, Jews would assemble together to commemorate Hakhel, during which they would congregate to plot out the course for the next seven years. Today, the seven-day festival is a time of celebration and reflection in the Jewish community, and the sukkah in contemporary times has become an opportunity for designers and architects to showcase their skills. Three years ago, the Leichtag Foundation hosted its first Sukkot Design Expo, during which they invited design teams to submit sukkot designs. Seventeen designs were submitted, and ultimately three were built. This year, however, the foundation opted to partner with NewSchool, which had submitted designs in the previous expos, to build a singular sukkah that could serve as a community gathering space during the festival and fit upwards of 120 people. The teams were to draw inspiration for the structures from the wooden roller coaster toys that often populate waiting rooms at dentist or doctors’ offices. Ten design teams at NewSchool worked during the summer to create entries for the competition. Of the 10, two teams were selected as finalists. The winning team’s design drew upon inspiration from both the toy and the Hebrew word for “Sukkot,” with each of the tent’s three partitions representing a letter in the word and the present, past and future of the community. The “past” room provides a place for people to reflect, the “present” room provides the main assembly area and the “future” room is the interactive component, where children can do activities such as painting and playing with musical instruments. Sherman said that some elements of the other finalists’ designs would be incorporated into the final sukkah, which will be assembled at the October festival.